This important cultural analysis tells two stories about food. The first depicts good food as democratic. Foodies frequent ‘hole in the wall’ ethnic eateries, appreciate the pie found in working-class truck stops, and reject the snobbery of fancy French restaurants with formal table service. The second story describes how food operates as a source of status and distinction for economic and cultural elites, indirectly maintaining and reproducing social inequality. While the first storyline insists that anybody can be a foodie, the second asks foodies to look in the mirror and think about their relative social and economic privilege. By simultaneously considering both of these stories, and studying how they operate in tension, a delicious sociology of food becomes available, perfect for teaching a broad range of cultural sociology courses. As Johnston and Baumann show in their stimulating analyses of the gourmet foodscape today, food both divides people and brings them together. Their illuminating interviews take the reader into the foodie subculture where food becomes lifestyle, where the food-possessed daily negotiate the contradictions of class, gender, and work, the tensions of pleasure and necessity, and the dynamics of the individual in our contemporary world. The new chapter on gender is an especially welcome addition to studies on the sociology of food. When Johnston and Baumann first wrote about them, foodies were an exotic minority. Now they are everywhere. We perform our social being through increasingly exquisite food practices and signals, so the analysis of foodies is really the analysis of social life. This new edition goes beyond the first by dissecting how gender complicates the foodscape. A remarkable book. Johnston and Baumann's taxonomy of foodie discourses is illuminating. My students received a great introduction to methods of textual analysis. 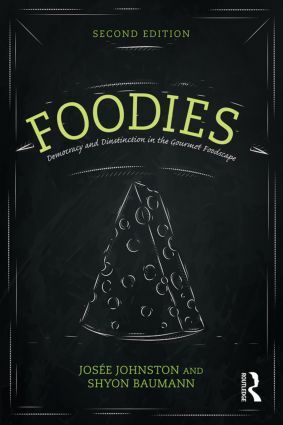 In this new and improved edition of Foodies, Bauman and Johnson lead us in a fascinating discovery of how exoticism and authenticity organize a world of hyper cultural sophistication structured by pleasure and knowledge. Their book is a first rate scholarly contribution to our understanding of how frames, ideologies and discourses feed group boundaries in a context of growing inequality. And as a bonus, the book is as entertaining and appealing as it is an insightful read! With the proliferation of books claiming to examine food culture – an explosion reminiscent of kudzu or zebra mussels – a reader should begin the singular text that examined that phenomena in all of its richness. Foodies, now in its Second Edition is that iconic text. If one only examines one book about gastronauts, this is the book. Examining the strains of egalitarian and authentic food culture and a food culture that privileges inequality, Johnston and Baumann have the wisdom to see this phenomenon as a social comedy, but one that they view with a generous and critical vision. Foodies demands a dialogue among all of those who care about our expanding culinary culture, and the ways that it enriches our lives as well as separating the wealthy and the struggling. This is the big enchilada. Josée Johnston is associate professor of sociology at the University of Toronto. Her major substantive interest is the sociological study of food, which is a lens for investigating questions relating to consumer culture, politics, gender and the environment. She has a forthcoming book with Kate Cairns entitled Food and Femininity (Bloomsbury). Shyon Baumann is associate professor of sociology at the University of Toronto. He studies questions of cultural evaluation, legitimation, and classification. In addition to the study of gourmet food, he has investigated these questions in the realms of Hollywood films, television advertising, and ethical consumption.